The Lady Spartans Swimming and Diving team hosted the Daniel Hand Tigers in Orange on Tuesday, Oct. 16, and guess what. 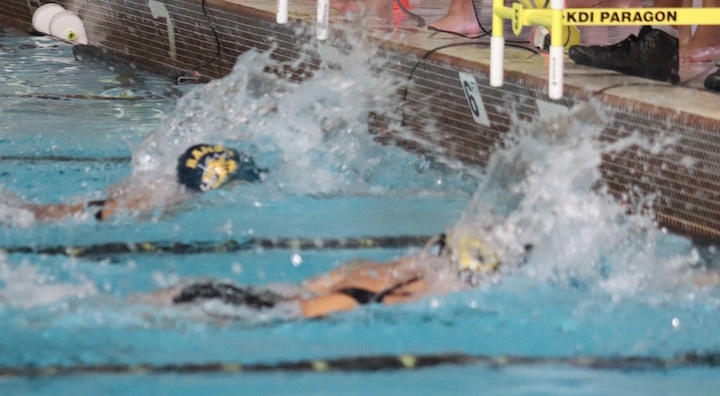 The Lady Spartans Swimming and Diving team was on the road in North Haven on Friday. Although Amity only won four of the 12 events, the girls outscored the home team by 11 points and defeated North Haven 97.5 to 86.5. The Amity Spartans Boys Ice Hockey team hosted the New Milford Green Wave in West Haven on Wednesday night. This wasn’t the most exciting game this season, but it had a satisfying result for Spartans players and fans. It is always great when your team is the first to score, and that’s what Amity did at 4:08 in the first period when Connor Bath (#14) made a goal assisted by Joey Schittina (#11) and Jacob Silliman (#6). For the remaining two periods goalies Michael Halloway for Amity and Hayden Giampetro for New Milford helped prevent any further points from being scored, so Amity wins this one 1-0. 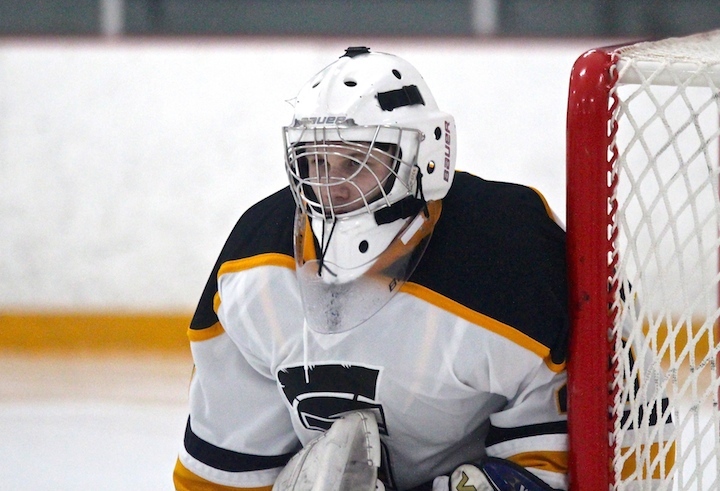 Next Up: On Saturday, Jan. 27, Amity is Away in East Haven for a game against Guilford (9-2) at 7 p.m. The Lady Spartans Outdoor Track Team continued its amazing season with another double win on Tuesday. The girls went up against Hillhouse and Cheshire in Woodbridge. Team scores: Amity 100, Cheshire 46; Amity 78, Hillhouse 63; Hillhouse 75, Cheshire 71. Javelin: 1, Moscato, Zoe Marie, Amity Region, 111-10. On Tuesday, April 28, Amity hosted Fairfield Prep and Hamden for a track meet. Amity distance Runner Kyle Beaudette and Hurdler Aaron Rattley each won two events. Amity once again came out on top. Team results: Amity 129, Fairfield Prep 19; Amity 98.5, Hamden 50.5; Hamden 92, Fairfield Prep 36. On Tuesday, April 28, Amity hosted Sacred Heart Academy and Lauralton Hall for a track meet. Amity’s Zoie Reed won the 100, 200, Long Jump and 4X100 Relay; Lauren Duhl won the 100, 300 Hurdles and 4X100 Relay. Like the boys team, Amity came out on top. Team results: Amity 120, Lauralton Hall 21; Amity 101, Sacred Heart Academy 40; Sacred Heart Academy 104, Lauralton Hall 37. Javelin: Moscato, Zoe Marie, Amity, 103-08. The Amity Spartans Boys Lacrosse team came on strong under the Friday Night Lights in Branford in its second game of the season. The Spartans were ahead of the Hornets 2-1 in the first quarter; 4-2 in the second; 6-4 in the third and kept the lead all the way to the end with a 7-5 win. Brad Uscilla led Amity in scoring with 3 goals and 1 assist; Jake Milner had 1 goal and 2 assists; Sam King, Ben DiMauro and Matt DeLizio each had 1 goal and Nick Mazzacco had 1 assist. Noah Lohman made 2 goals for Branford, E. Duffy, Mike Potter and Mike Caminear each made 1 goal. Goalies on both sides worked hard, Evan Campbell made 12 saves for the Spartans and Zach DeGoursey made 11 saves for the Hornets. 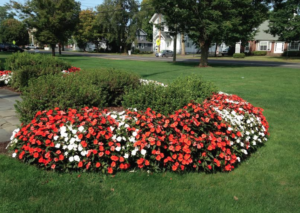 Records: Amity, 1-1; Branford, 1-1. Amity goes up against Daniel Hand Monday, April 13 in Woodbridge at 3:45 p.m. and away at Guilford on Thursday at 7 p.m. The Amity Spartans Senior Night game against Trinity Catholic took place at the Bennett Rink in West Haven at 1 p.m. on Saturday. Among the surprises was the starting lineup, which included fan favorite Senior Christian Mortali, who entered the ice to cheers from the stands and wide smiles from his teammates. The event started off as many Spartans games have this season, with the other team making the first point. The first period was a bit of a sleeper, with slow motion moves until Trinity junior Dan Bernard (#20) scored a goal off an assist from Jordan Skiba (#7) at 6:59. In the second period both teams came alive, Trinity quickly scored with Griffin Northrop (#10) getting one past Amity goalie Tyler Johnston on an assist from Zach Lockwood (#25) at 2:53. Northrop made an unassisted goal at 6:13 bringing the score to 3-0. Amity’s captains came together to get the Spartans onto the scoreboard at 7:17, Zach Shelnitz (#8) scored off an assist from Kevin Ryan (#9) and Dalton Luciani (#28). Trinity fought back, scoring again at 9:10 with Joey Nelson (#14) firing one in on an assist from Connor Scanlon (#3). But Amity wasn’t done yet, Zach White (#13) got a goal assisted by Ryan and Luciani at 10:21. With just 22 seconds remaining in the middle period Trinity’s Northrop got a Hat Trick on an assist from Bernard, bringing the score to 5-2. The final period began with another quick move from the boys from Stamford, Nelson made an unassisted goal at 2:43, peaking Trinity’s score at 6. Then, 14 seconds later, Anthony Uscilla (#16) flew across the ice and slapped one into the net for Amity. At 4:07 Shelnitz scored off a Ryan assist. At 5:22 Charlie Csejka got a goal on an assist from Luciani, and at 6:34 Nick DeGennaro (#5) made an unassisted goal and tied the game at 6-6. As the game drew to an end Ryan scored off an assist from Mac Deane (#22) at 11:35 and with only 49 seconds remaining, Uscilla made the final, game winning goal off an assist from Luciani. The Amity Boys Hockey Team showed us last week (Jan. 23) that they really knew how to play the game. They came alive in the third period and gave fans hope for the season. On Saturday, Jan. 31 they started strong against Guilford and kept it going until the final second. In this matchup, Amity was first to post in the first period at 2:44 with Zach Shelnitz (#8) scoring on an assist from Liam Caraciolo (#17). 4:33 into the second period, Guilford’s Ryan Brand (#17) tied things up with an unassisted goal. But the Spartans would have none of that, and at 7:00 Shelnitz and Caraciolo repeated the first period play, pulling Amity to a 2-1 lead. Nearly two and a half minutes later at 9:27 Guilford’s Rick Sardella (#9) tied the game at 2-2 on an assist from Matt Clifford (#12). Amity’s Kevin Ryan (#9) made the tie-breaking and game-winning goal at 12:38. Neither team scored in the third period, but the puck was passed and smacked and skates were flying across the ice as shots were made, making it an exciting 15 minutes for spectators. This may be the first game that Amity outshot its opponent, with 26 to 20. Goalies (both #30) Tyler Cole for Amity and Kyle Dwyer for Guilford worked hard in this game, and deserve a lot of credit. Asst. Coach Mike Richetelli and the other coaches were smiling as they came off the ice after the game. Richetelli said the boys will continue to practice hard and play to win. The Spartans next three games will be against tough opponents. • On Tuesday, Feb. 3, they play Cheshire at Wesleyan University at 7:30 p.m.
• Saturday, Feb. 7, New Milford at Canterbury School at 12:45 p.m.
• Then Wednesday, Feb. 11, against West Haven at 6:30 p.m. 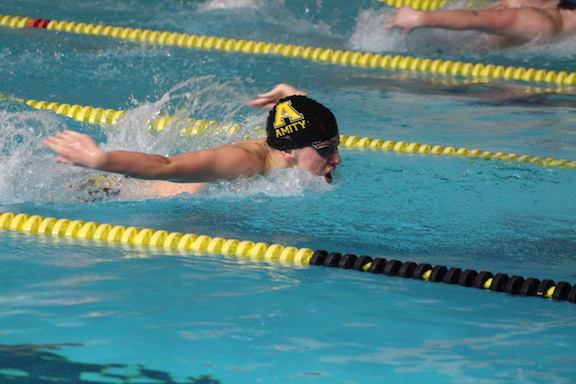 The Amity Boys Swimming Team went up against Daniel Hand at the Orange Town Pool Tuesday night, Jan. 20. 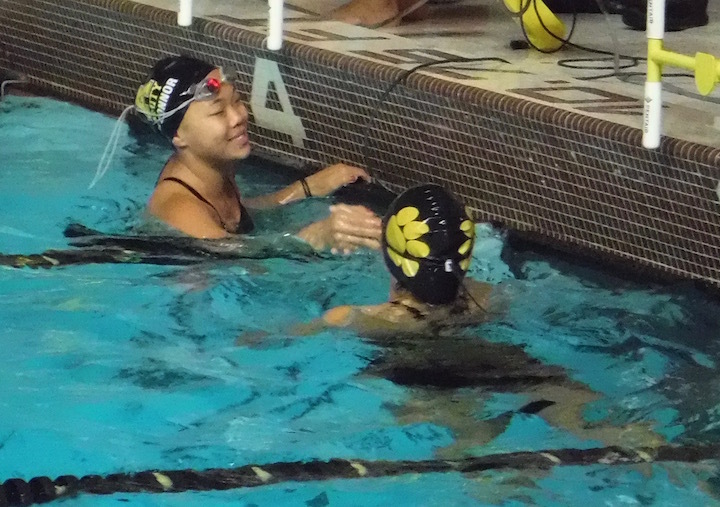 At this meet, the Spartans came out on top, defeating the Tigers 99-86. The Spartans’ standouts were Ben Clemens who was in 4 winning events; Zac Babbitz, Colin Roy and Ben Bacal each with 3 winning events. 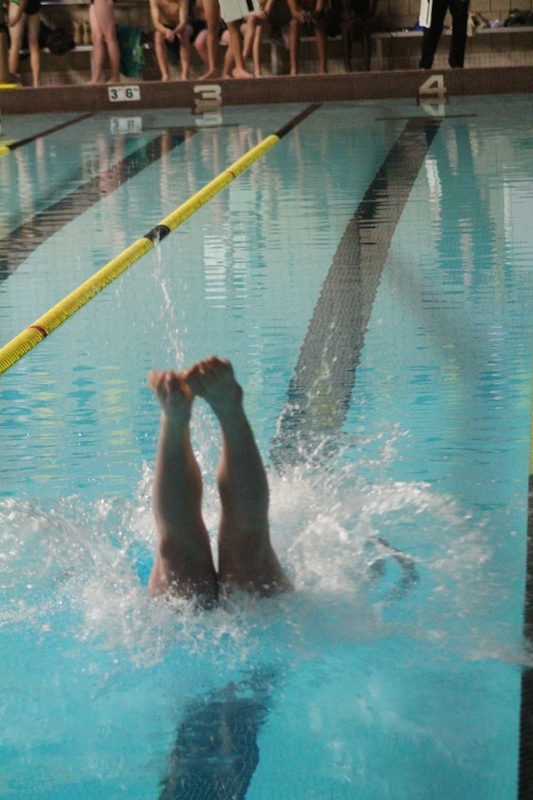 Hand’s top swimmer was Paul O’Connor who won two of his team’s four winning events.